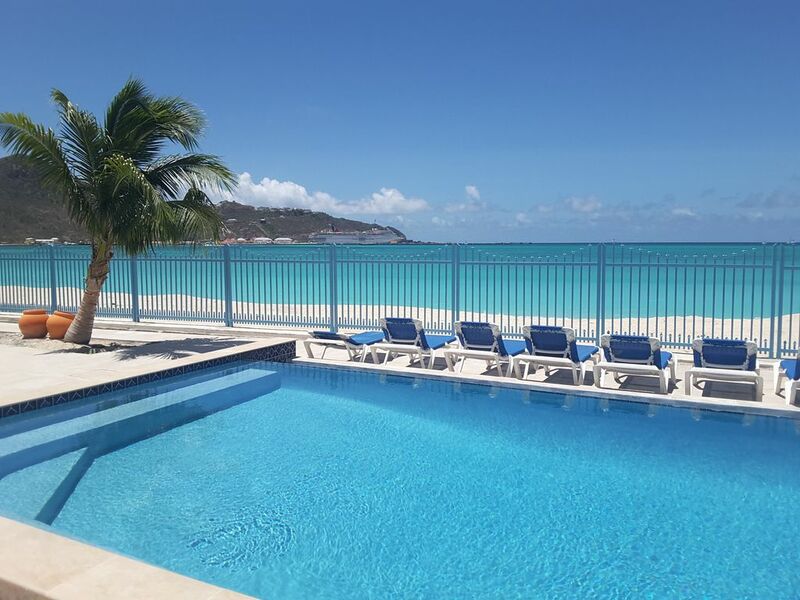 Private and tranquil two story beachfront townhouse (end-unit) situated directly on the white sand beach and turquoise blue waters of Great Bay, in a quiet area of Phillipsburg, the Dutch capital of St. Maarten. This is a small, intimate and friendly gated complex comprised of only 12 individual villas with on-site management, an infinity pool overlooking the beach, and surrounded by lush tropical gardens. There are several lounge areas for you to choose from every day, including right beside the pool, in the shady breeze way, or directly on the gorgeous beach. On the main floor is the spacious living room, kitchen, dining area and a powder room. The unit is fully air-conditioned for your comfort. You have your own private lanai shaded by palm trees where you can enjoy meals and cocktails while watching the beautiful cruise ships come and go without experiencing the crowds (a favourite past-time of all visitors who visit our complex)! Our on-site management team are our amazing ambassadors who will happily provide you with any assistance and information you may need to make your stay more enjoyable. The complex is isolated from the hustle and bustle of Phillipsburg, but is located a mere 5 minute stroll away. can decide to spend a quiet day by the pool or on the beach or walk into Philipsburg and enjoy the myriad of shops, restaurants and casinos that it offers, or do a little of both! It is not necessary to rent a car in order to make the most of your vacation here as there are do many amenities and activities within close proximity. There is also a local bus service nearby that is an affordable and convenient way to get around. If you do choose to rent a car, navigating the 37 square miles of the island is a piece of cake. Including Great Bay Beach, there are 37 beaches on the island (1 beach for every square mile!) and they are all within a short driving distance. Hopefully, you will discover that this is your 'home away from home', just as we did! Loved it. Great location. Relaxing quarters, nice amenities. We would stay again. Nous revenons d'une semaine au soleil (et à l'ombre) à cette superbe villa. Des hôtes accueillants et un manager local (Wally) toujours disponible. St-Martin se relève toujours progressivement de l'ouragan Irma. On voit la résilience des locaux. Les commerces sont pratiquement tous ouverts à Phillipsburg (les jours où les bateaux de croisières se pointent). Site agréable avec la plage à deux pas; On se baigne donc 4-5 fois par jours. Les lieux sont tranquille et à 15 min à pied le long de la plage des commerces et restaurants. We LOVED Villa Foxie! The villa is lovely & comfortable with a nice beach feel. Everything you need is there like beach towels, lounges, umbrella, coolers. The kitchen has plenty of supplies. We stayed in the ocean facing bedroom so we could listen to the waves. The upper deck with chairs & lounges is a great place to relax in the morning and at night. It gets full sun in the afternoon if you prefer a little more private sunbathing. We enjoyed having breakfast on the back patio everyday. We spent time on the beach & on the patio lounging under the umbrella. There's nothing better than being right on the beach! It's a short walk up the beach to the restaurants/bars/shops on the boardwalk & Front St. Cruise ships are in everyday, but the villa is situated a little away from the beach crowds. Rose Marie, the owner, is lovely and welcomed us with warmth & a wonderful bottle of wine. Wally, the property manager, is friendly & helpful. Both are available if you need anything.or have questions. Wally also picked up lobsters one day for guests & prepped them for us to grill. What a treat! We had a wonderful vacation...and may be back next year! Amazing place! Beautiful, clean, and steps away from the water! We loved out stay in Foxy Villa, #7. Beautifully decorated beach theme throughout. Everything we needed, and some we never thought of. Hosts Gerard & Rose Marie were friendly and super helpful. Wally the groundskeeper was so nice and helpful. He attended to our small requests and recommended places to eat. Such thoughtful people. But THE BEACH!. Beautiful bay, private and peaceful, views of the cruise ships...Best place we've stayed for sure. A quick walk to the boardwalk, drinks, food shopping. Perfect in every way. We'll be back next year! We are very happy that your stay is fabulous. Thank you so much Rose Marie . We were enchanted by our recent stay at your beautiful Villa. The French wine & Water you had nicely chilled in the fridge were just one indication of your hospitality. It is hard to imagine staying anywhere else after our week here. Rose Marie and Gerard have a lovely villa (villa 1). All the pictures you see, yes, they are for real and more magnifique in person. We cooked breakfast in every day on our time. It's been a hectic year right up to the day we left for PHL airport, so doing nothing for seven days to me was paradise. Bed is comfy, shower is warm, love the light in the handheld shower head. The lanai is relaxing while having my first cup of coffee. All the restaurants and stores needed are within walking distance. We never felt unsecure, at the villa, at the deli or on the boardwalk in Phillipsburg. Everyone is pleasant. Jim is always around somewhere if you need him. Thank you Jim! Merci Rose Marie and Gerard partager votre maison. In addition to the above, there are many casinos on the island, including some only a short walking distance away. Numerous shops and gourmet restaurants are also a 5 minute walk down the beach. Enjoy sitting back and watching the beautiful cruise ships come and go from your private lanai. Including beautiful Great Bay, where the villa is located, there are 37 amazing beaches on the island, all within a short drive away. Experience both the Dutch and French culture and take easily assessible excursions to St. Barts, Anquilla, Saba, Prickly Pear, Creole Island, etc. Our on-site management team will be happy to assist you in arranging discount tours and car rentals. Rates are quoted on a maximum of 4 persons, 50% deposit to secure the vacation. Balance is due upon arrival. We accept VISA, MASTERCARD.